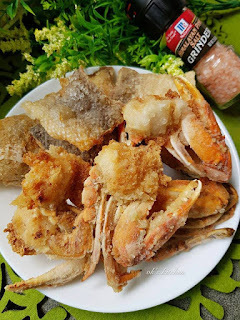 1) Wash the salmon skin and small size flower crabs. Pat dry with kitchen towel. 2) Dash of McCormick Himalayan Pink Salt on it. 3) Coat it with plain flour. 4) Heat up the wok with cooking oil. Add in the salmon skin and crabs when the oil is smoking hot. 5) Remove the salmon skin and crab when it turn brown. 6) Dash some of McCormick Himalayan Pink Salt before serve.